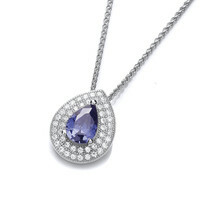 Beautiful sparkling cubic zirconia pendants which are just gorgeous to wear any time of day or night to add just the right about of glitter and glamour to suit you. All our silver jewellery is handmade using the highest quality 925 sterling silver and AAA* cubic zirconia stones. It is also Rhodium plated to stop it tarnishing and make it less likely to scratch. All our cubic zirconia pendants are available with or without a sterling silver chain - simply select which option you want from the drop-down box. Delivery is free of charge in the UK and presented in a branded gift box.